One of the finest methods of discouraging wrongdoers from targeting your home or property for theft or damage (even when you are thousands of kilometers away from your location), is by having security cameras installed at your property. With remote monitoring you can keep trespassers at bay and even keep a watchful eye on your children or loved ones. 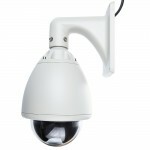 The modern security video camera systems of today can easily be linked to computer programs (video camera network security software applications), which allow you to log into your system and review live footage from any location you happen to be. As the cameras can be linked to computers the footage can be captured on your hard drive and also at multiple separate storage facilities. The advances of video technology means you can now review the footage from your cameras in high resolution. Footage can be captured in High Definition which means you can see anyone who breaks into your premises with a lot more detail. Modern cameras also features CMOS recording chips which allow the camera to record sharper images through the lens in low light conditions. Modern advances in compression software means file sizes are also reduced significantly so you don’t eat up all the space on your back up hard drive and need to wipe it every week. Footage from CCTV used to be awful, the resolution was extremely poor, and some systems only recorded snap shot frames, and did not actually record live footage. Cameras also feature night vision technology which allows for clear recording during the pitch black of night, a time when nocturnal criminals like to be active. Add into the equation, wide angle lenses, motorized remote control camera movements, and housed in an all weather & vandal proof camera encasings, your system will stay armed 24/7 during all seasons of the year. The following are a few of the typical kinds of security video camera systems, classified primarily on the basis of the camera variation and function & marketplace use. All systems can incorporate any of the technologies into their systems. These cameras feature the utmost in resolution and can include remote control and zoom angle and focus manual controls (like PTZ cameras). These systems will be rugged, remotely monitored and can include multiple cameras being fed into a main interface. Features such as heat and movement tracking can be built into the system. Idea for town center CCTV monitoring or anywhere with large crowds, or large buildings and homes with sensitive documents or extreme luxuries. Also useful in Government buildings when security is key. As the name suggests there are hundreds of brands of home camera systems available for home security needs.These systems can range from just over a $100 to $1000’s depending on what you buy. Thankfully you can purchase remote monitored intelligent wireless security camera systems with motion sensors for $200-300. Being able to log into your system via a smartphone or internet interface is a blessing. Used in conjunction with a motion triggered siren alarm system, your home will not only sound an alarm if a intruder breaches a specific area of your property, but it will also alert you, and/or the authorities, plus record the footage as evidence. If discretion is of the utmost importance to you a small discreet bullet or lipstick cam system will be perfect for your needs. These small camera systems provide ultra sharp day or night vision footage, extreme wide angle high definition recording and are available in weatherproof models. If you are not using a wireless camera system, your set up is too old. Wireless systems utilize online network security software applications. They stream the footage automatically over internet connected devices. Use of video monitoring software is so affordable as is online hard drive back up servers, it would be unwise not to take advantage of their capabilities. If your system gets deactivated or your computer hardware is stolen or destroyed by fire, an explosive device, or through intelligent theft, you will have a backup of the camera footage stored safely at another location, to be used as evidence. PTZ stands for pan-tilt -zoom; the basic functions of any video camera. This cameras allow you to zoom into the action and swivel on their axis. Ideal for crowd control, picking out offenders or seeing far off into the distance. They are also useful for scanning an area in more detail, and for use in situations when break ins are not the issue, but crowd control and law and order control are essential. Vari-focal camera allow you to adjust the viewing angle of the lens. You may for example need to set your camera up to record a wide angle field of vision. On the other hand you may need to zoom in to cover a distance that is further away from your camera. If you also ever move the camera, you can readjust the angle on a vari-focal camera to suit your new perimeter. A dome camera is an unobtrusive camera designed to blend into the background. They are usually found indoors, in shops or offices. They are usually mounted to ceilings and walls and can also be controlled so they swivel on a base plate to change the viewing and zoom angle. They can also be put in vandal and weather proof casings. 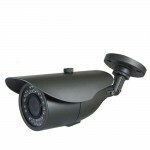 An IP camera is any type of camera that can be used to stream clips over the internet. IP stands for internet protocol, which effectively is the method data is shared across the internet between devices. Each device that can connect across the internet has an ID. This is how hackers can infiltrate unprotected systems. Even a webcam can stream footage across the net (think Skype for one). 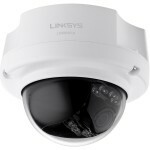 The term IP camera is usually reserved for cameras classified as surveillance cams. Nowadays IP cameras can record directly onto DVR’s as well as stream footage to servers across the net.